One of the biggest challenges you face as a business owner is getting people into your business, or if you’re a realtor, into a home you’ve listed. Often, if you can get someone to come through your doors so they can see what you have to offer, they become a customer. 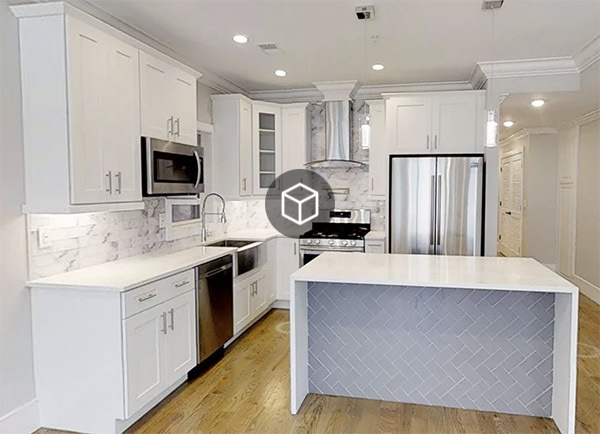 3D tours by Matterport are not your mama’s 360 tours. With Matterport, your prospective customers can move around a room, and go to the next room, as easily and intuitively as if they were actually in the space. After a 3D tour by Matterport, many people say they feel as if they’ve physically visited the space; that’s how good the technology is! Home must be fully staged and camera-ready; waiting time $80/hr (15-min increments). Additional floors incur a $100 surcharge per floor. Apartment must be fully staged and camera-ready; waiting time $80/hr (15-min increments). Additional floors incur a $100 surcharge per floor. Businesses/organizations that could benefit from using 3D models as part of their marketing efforts: Restaurants/pubs; Gyms/athletic clubs; Museums. Property insurance firms; Construction and engineering firms; and more, depending on your imagination. *Prices shown do not include applicable Gross Receipts Tax, which will be added to invoice. Processing fees and first year hosting fees are included in prices shown. Deliverable includes 3D model link and embed code for model, hosted up to one year. Beyond first year, annual hosting is $50 per model. Models will not be delivered before payment is made.